Click to zoom in on part of primes symbol. Prime numbers are disivible only by 1 and themselves. 1 is not considered to be a prime number. 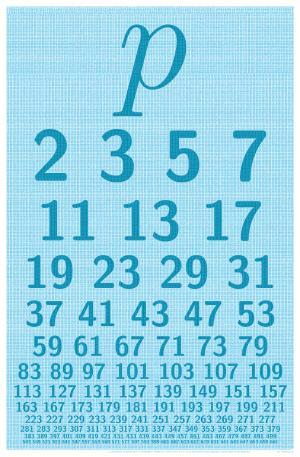 This poster shows the Primes symbol (p) followed by the first 122 prime numbers. Upon closer examination, 54,222 prime numbers are visible. How many numbers can you recite?